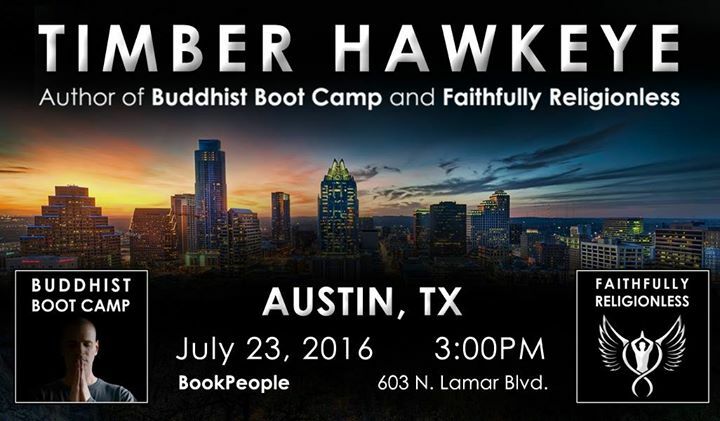 Join Timber Hawkeye, bestselling author of Buddhist Boot Camp and Faithfully Religionless, for a book talk, discussion and Q&A. This is a free event as part of a book tour across the U.S., and everyone is welcome! Ten years ago, when I left the corporate world and moved to Hawaii, I started emailing my friends and family every month to let them know what’s going on in my life. About eight years later, my friend Kim suggested that I share those emails with the world because she found the letters inspirational, and she figured other people would benefit from reading them as well. That’s how the blog-to-book Buddhist Boot Camp was born! Each chapter is only a page or two long, and you can read them in any order. Faithfully Religionless reads more like a conversation that we might have on a park bench somewhere. It is an open and honest memoir that gets more intimately personal than Buddhist Boot Camp did, while still sharing the underlying intention to awaken, enlighten, enrich and inspire. Kim was right! People all over the world have found the message in Buddhist Boot Camp refreshing, inspirational, and more importantly, motivational! I think motivation is more important because inspiration without action is just entertainment. My invitation is for us to go beyond thinking that something is a “good idea” to actually implementing it into our daily lives. The stories and quotes in both books offer mindfulness-enhancing techniques that anyone can relate to, reinforcing what we intuitively know but have somehow forgotten: how to live a simple and uncomplicated life while being the best version of ourselves there is. The way I understand it, God has very little to do with religion, the Bible, or, least of all, the church. But when people have a bad experience with one aspect of their faith (be it the church, the Bible, local clergy, or when religion gets mixed with politics), they end up tossing all of it away (God included), throwing the baby out with the bathwater, so to speak. So while religion asks us to believe in someone else’s experience of the divine, spirituality invites us to have our own. What I love about Buddhism is that it’s not a religion (no creator theory nor a story about the beginning or end of times). It also doesn’t require other beliefs to be wrong, but rather strengthens your existing faith (whatever it may be). That’s because Buddhism is all about training the mind, and I think boot camp is an ideal training method for this generation’s short attention span. It’s unfortunate that Buddhism is now treated as a religion by some, focusing more on its ritual than its practice. But the Buddha never claimed to be a God, the son of God, or a messenger of God. He was a man who gained clear perspective of the world through nothing more than human effort. And if he was able to do it thousands of years ago, then we can do it today! It is very possible (and perfectly okay) for people who are Catholic, Muslim or Jewish, for example, to still find the Buddha’s teachings motivational.